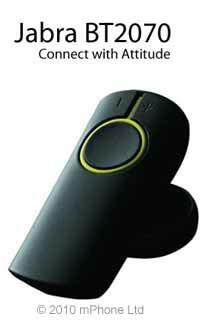 Connect with Attitude The Jabra BT2070 offers edgy hands-free design for people who want something out-of-the ordinary. This unique headset has an intriguing design that centers around an illuminating yellow circle that lights up for incoming calls. The BT2070 performs as well as it looks with simple functionality and staying power. Simple 3-button interface puts connection at your fingertips. Get started straight-away with automatic pairing and just touch the circle to talk. The staying power is great for a headset so small – with impressive talk time that means you can enjoy all-day hands-free comfort and convenience. Edgy and stylish with quality to back it up – the Jabra BT2070 is state-of-the art hands-free device that lets you connect with attitude. Buy this product today and receive your headset with 2-3 working days, or Click to view other Bluetooth headsets.